Long ago, it used to be that putting an advertisement in your local paper or magazine was enough to spread the word about your brand. It evolved, and spending $10 here or there on a targeted Facebook ad became a quick way to push a BOGO deal to local customers. With each passing year, restaurants are asked and expected to do more and more to reach customers. Your customers have more influence over who you are and who you will be more than ever before. As a result, your story must resonate with your customers emotionally, digitally, and physically in order for you to be successful. One area of change that customers are looking to see is for the support of sustainable and green practices. Catering to the “sustainable” demographic will help restaurants attract young adults and a more affluent demographic. These consumers also tend to be more tech-savvy and digitally connected than your typical customer. This means your customers will be able to connect with you through other forms of marketing such as email, social media, and the web. If this initiative proves to be successful, your restaurant might end up changing your customers for the better. This is where your restaurant can begin to shine. Start pickling, fermenting and canning some of your foods to add a sustainable touch to your menu items. Not only does this technique extend the life of seasonal and local goods – they add a little flavor punch to your dish! We will talk about where the source of your food should come from a little later in this article, but when it comes to marketing your new, sustainable menu, start using the words “fresh,” “real,” and “natural” to any applicable components. The food industry now sells almost $41 billion worth of food each year labeled with the word “natural,” according to data from Nielsen. These words immediately draw the eyes and interest of desirable customers. If you are adding new menu items based on what’s in season, don’t be afraid to adapt your menu to communicate this to your customers. “Seasonal Vegetables” or “Seasonal Fruit” as a menu item add on can go a long way to engage conversation from your customers and pique their interests. Consider changing your menu with the season four times a year. Take a look at your restaurant’s current operational strategy and see if there are any sustainable improvements you could make. Do you have an oven that takes twice as long to cook items? Do you have an old refrigerator? Consider putting aside money to invest in you to make production a little easier for the team. Also, try to find ways where your restaurant could encourage reuse. For example, provide glasses to your patrons (for those dining in) to use at their own filling station instead of using paper or plastic cups. For delivery orders, provide recycled paper napkins and compostable containers, or invest in containers that customers can use again for meal planning. To start saving money for new energy-efficient appliances, swap out your old bulbs with some LED lights. This could help trim down your electric bill. If you’re also looking to style your restaurant a little differently, consider using reclaimed word, tabletops, old doors, and more to give a restored vibe to your space. You should also begin (if you aren’t already) sourcing and supporting local farmers and producers. If it’s difficult to get product local, try supporting family-owned or minority-owned producers to give back to their mission and business. Outside of keeping all of your ingredients as local as possible, build a family with local non-profits who could use your support such as local food banks, shelters, and soup kitchens. Furthermore, restaurants and companies that help lead the way on sustainability issues will likely reap dividends in the form of the patronage of an approving mainstream public. The survey data reveal that women and higher-income consumers are particularly receptive to menu claims that promote sustainability. Likewise, young adults age 25-34 and families are more apt to be influenced by a range of sustainability and sourcing menu terms. It may seem difficult to tackle all of these components at once. Instead of trying to do it all and save the world, think about your goals and consider what is realistic to achieve now and what your team can do in the future. If it’s as simple as using recycled paper for your menus, start there. 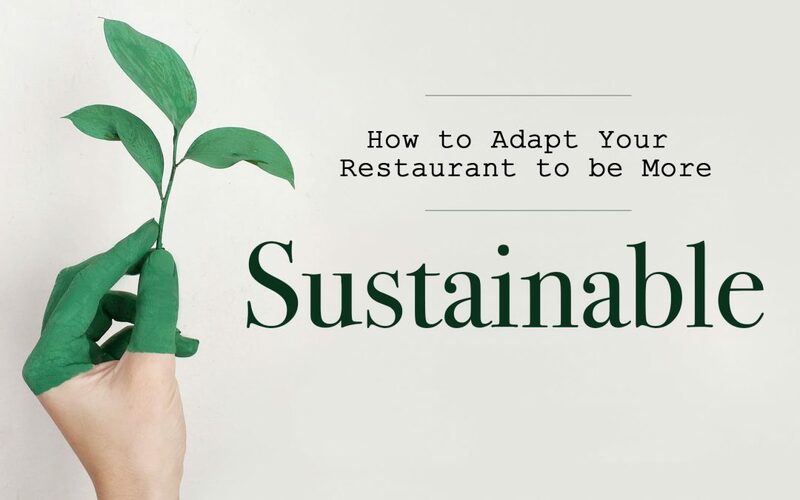 Get creative with how you can make your restaurant more sustainable for you, your customers, and your community.